WEST LAFAYETTE – Grady Eifert's contributions to Purdue's success are sometimes difficult to spot in a box score. On Saturday, however, the Fort Wayne native proved he can fill a stat sheet, too. Eifert, a former Bishop Dwenger standout, scored a career-high 16 points on 4-for-4 shooting and added seven rebounds and four steals to push the No. 15 Boilermakers to their eighth straight win, 81-62 over Nebraska, on “Hammer Down Cancer” Night at Mackey Arena in front of an announced crowd of 14,804. Carsen Edwards added 27 points on 8-for-16 shooting for Purdue while Nojel Eastern had 12 points, 10 rebounds and four assists. Eifert played a key role in the 14-2 Boilermaker run early in the second half that turned a tight game into a Purdue romp. After Ryan Cline hit a 3-pointer to expand the Boiler lead to seven at 42-35, Eifert dove on the floor for a steal and grabbed the ball. He saw Eastern streaking the other way and passed it ahead from his back for an easy layup. On the next Purdue (17-6, 10-2 Big Ten) possession, Eastern returned the favor. The sophomore drove through the lane and kicked to the corner, where a wide-open Eifert was waiting. The senior buried his second 3 to put the Boilers up 47-35 and force a Nebraska timeout. The 3-pointer was part of a stretch in which Purdue hit eight straight shots. As the teams headed to the sideline, Matt Haarms yelled excitedly at Eifert, while Aaron Wheeler gave him a playful shove and the crowd exploded. 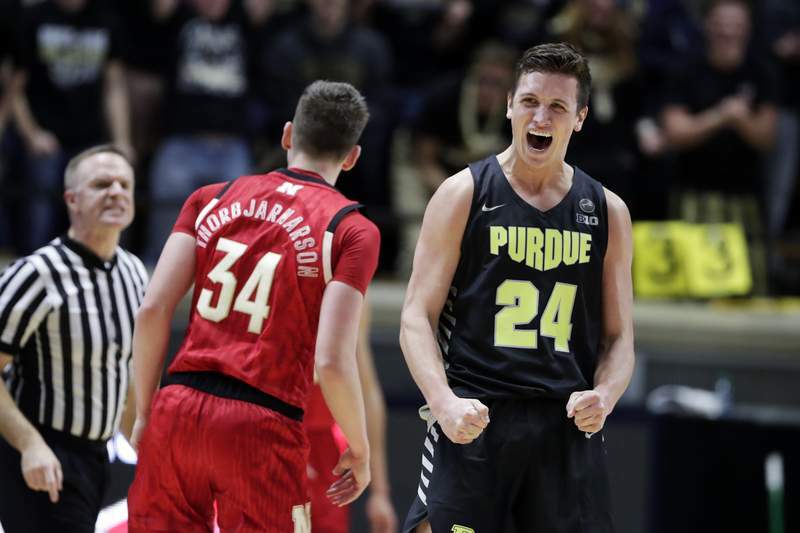 Nebraska never really threatened again and Purdue cruised to a 14th straight home win. The Cornhuskers (13-11, 3-10) dropped their seventh straight game. Late in the game, Eifert stepped to the foul line, where he went 6 for 6 in the game, and was serenaded with “MVP” chants from the Purdue student section, a fitting coda to a career game for the former walk-on. Purdue outrebounded Nebraska 39-24 and held a 15-6 advantage in second-chance points. Eifert did some of his best work on the offensive glass, pulling down five rebounds on that end. For the recognition of the battle against cancer, Purdue donned special jerseys and warmup shirts, with the usual gold letters and numbers replaced by neon green. The jerseys were auctioned off online, with nearly $13,000 in proceeds going to the Tyler Trent Endowment Fund at the Purdue Center for Cancer Research. At halftime, Purdue athletic director Mike Bobinski presented a check for that amount and a framed specialty jersey to the family of Trent, the Purdue superfan who died of bone cancer at 20 in early January. There was an emotional moment as Trent's father accepted the jersey and, while seemingly fighting tears, raised it above his head, drawing the loudest cheer of the night.